I was recently invited to review a lovely, fun summer vacation photo frame from GiftsForYouNow - and given the opportunity to give one away as well, so today I am happy to let you know about this frame. 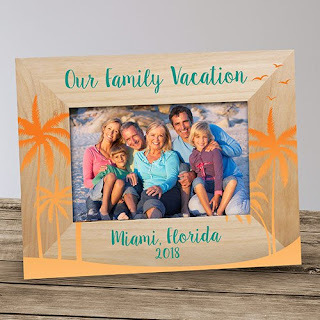 GiftsForYouNow says; "If a warm and sunshine-y locale is on the horizon for your family (or friends) – this charming printed wood frame is the perfect place to display your favorite vacation photo! Vacationing with the family is a treasured time. Remember your special trip to a famous landmark or weekend get away to your favorite vacation spot with your own Personalized Palm Tree Vacation Frame. We will customize this Personalized Vacation Frame with any custom message line for you to put in your destination and any year." 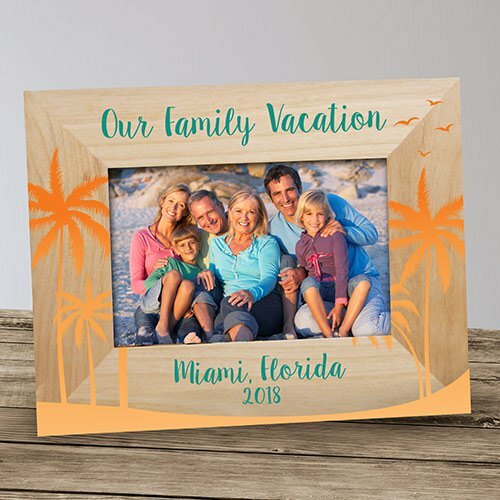 If you are planning a family vacation to a warm place this summer, plan to get this Personalized Palm Tree Vacation Frame to highlight a special photo - it is a great way to keep the memory in view! And it makes a great gift for someone special, too. In my case, I'm giving the frame I was sent to review to a special family at my church who has just made it through a very difficult year dealing with cancer. They were sent on a special vacation to a warm place and this frame will be a perfect way for them to highlight a wonderful memory from their trip. I'm very happy to say not only did GiftsForYouNow send one Personalized Palm Tree Vacation Frame for me to review, but they are making another available for me to give away (USA only). If you are over the age of 18, would like to be in this drawing on June 20, 2018, please comment below to share where you are going for vacation this year. In addition, if you have followed on Google Friend Connect, followed by liking on facebook with the tab in the "Find us on Facebook" box ON THE BLOG, or at this link (not just liking the post) and/or have followed grandma's cookie jar by email, you will receive one entry for each of these which you have done (as long as you let me know which of these you have done by commenting below.) Plus, if you "share" this post, you will receive one additional entry the first time you share in any of these places (please let me know when and where you share). This will help me draw names from among people who would like to win one Personalized Palm Tree Vacation Frame and it gives you several ways to enter the giveaway! Thank you for reading grandma's cookie jar and for sharing it with the people you know! This would be a wonderful vacation memory keepsake! My family is going to Tybee Island in Georgia this July. There will be 6 adults and 3 children. Will be our 5th year and we use the same photographer each year. Looking forward to lots of family time!!!! !